Wondering why my goodies seem to be a cut above the rest? Why my light fixtures and lamps, in particular, set cats yowling, bees buzzing, and elephants trumpeting? I've now been buying in France for over 15 years. For the more than ten years before I set my sights on France I specialized in lighting, and the skills I accumulated during those early years put me in exactly the right spot for dealing with French lighting. Well, sort of. If you've ever put an American lamp next to a French lamp you know that we're comparing Ripple to Rothschild. Ha-ha, but No Joke. The design and manufacture of lighting in these United States has generally followed that age-old American rule of thumb: the "KISS" effect (Keep It Simple, Stupid). Hell-bent on selling the most units at the least possible price, most American designers and manufacturers pared down their fantasies and aspirations to the lowest common denominator, choosing inexpensive materials and cookie-cutter concepts that would allow factories to crank out their product at low, attractive prices. So, for example, the vast majority of Art Deco chandeliers follow this formula: at the ceiling, ya gots yer canopy. Then ya gots yer chain (super important to give every customer the flexibility to hang the thing in a home with an eight-foot or a fifteen-foot ceiling). 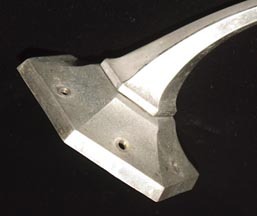 Then ya gots yer decorative device, which bolts into the belly of the fixture itself, a single casting with five openings for the "slip" shades. At the bottom is a finial. 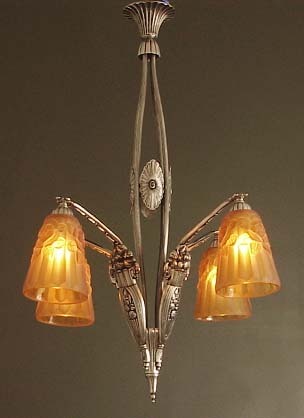 I wonder how many American Art Deco fixtures fit this exact model? Or should I say, what percentage of them fit it? Ninety-five percent, would that be too high? Now in all fairness (good luck! 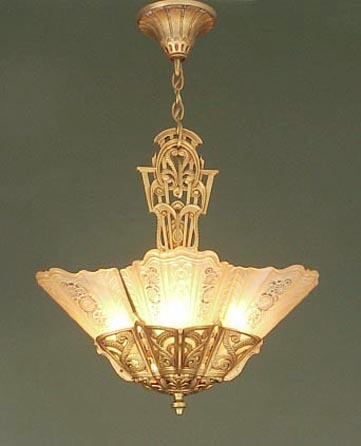 ), among the dozens of different American chandelier designs there were a few real zingers. 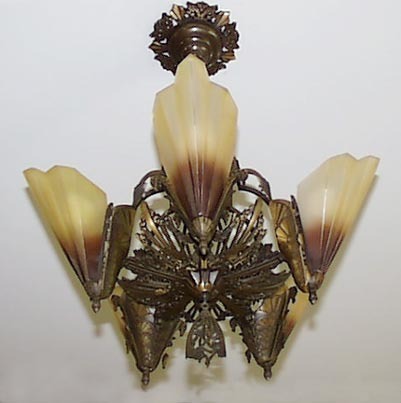 What we charmingly refer to as "brown-tip" bronze fixtures by Lightolier were at the top of the heap in the 20's and 30's and they routinely bring the most attention and money today. They're very ornate and fanciful, and their two-tone finish (on the bronze models) is inspired and lovely; their proportions are elegant and above all they have a certain dramatic quality about them. What more could you ask for? Canopy/chain/decorative element/cage with shades/finial. Among America's prettiest, but when I compare it to brie, chevre, or camembert... but, could I be comparing, as they say, apples to oranges? The problem is that the top half-dozen American designs constitute the exception. From there it's a pretty steep downhill ride. There are really only a small handful of American lights which tip the scales toward visual excellence, let alone high quality materials and craftsmanship (tough to bring that one into the discussion). Close inspection of many if not most of American products reveals, unfortunately, their mass-produced, make-a-quick-buck roots. In France, where for hundreds of years every young student has studied art and music -- in depth, as part of the essential school curriculum -- things have been done a bit differently, and the product reflects that. Not only are duplicates practically impossible to find, even similar concepts are immensely hard to come by. Some fixtures have lights pointing up, some down, some sideways (that's a joke but it's close to the truth). Every imaginable combination of glass and metal is used. Pressed glass, blown glass, etched glass, art glass, wheel-cut glass, painted glass, enameled glass. Brass, bronze, copper, white metal (not so often), aluminum; machined metal, molded metal, etched metal, acid-colored metal, polished, plated and painted metal. To name a few! Why, it's as though that French supervisor came in and said to his workers: "Mes amis, we have an infinite palette of materials and techniques in front of us. Use them!" And hang the cost, he might have added. Did you know, for instance, that Jacques Emile Ruhlmann, the mightiest design lion of the French Art Deco period, often lost money on his commissions?!! Such an exacting man, such a perfectionist, such an artist -- such a money-loser! In America the man would have been packed off on the first boat (one probably headed for France)! But I digress; and bless you, so far you've tolerated this frailty of mine, because you've gotten this far. We chicken farmers know we're not going to be buying any of Monsieur Ruhlmann's works anytime soon, so shall we get back down to earth? Likewise I'll limit my ravings about this compelling Modernist fixture by drawing your attention to the industrial-style glass rods "shade" which positively explodes the light in a cascading waterfall of light and glass; and that inverted "U" shape which counterpoints the small "U" shape at the bottom and on the sides, thereby bringing the whole concept into balance...and note how the pyramiding sections of the canopy mimic the rounded shape of the glass rods. This Degue is one of my favorites (I say "favorites" a lot, forgive me). The lush floral design on the square bowl and hexagonal shades reflects the French love affair with Nature, and those many hours in art classes seem to have paid off in the skillful way the flowers have been depicted. 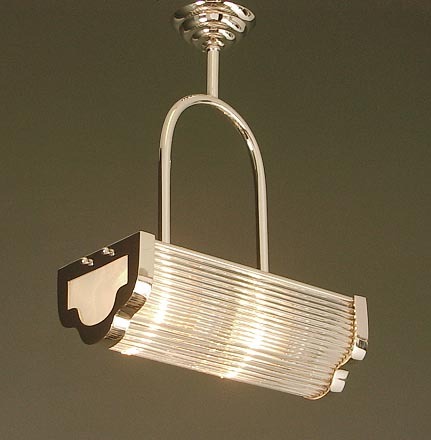 The minimal use of metal in this fixture (note the tiny canopy!) -- the bowl is cleverly held in place just at its corners -- focuses our attention on the glass; and the bowed supports, with their subtle pyramiding embellishments at the bottom, move our eyes in that direction. All in all, a tour de force! Looking good is one thing, but can you find the proof in that delectable pudding? With the French fixtures as well as the American, a close look reveals much. That "close look" is gained, in the instance of nearly every French fixture I've got for sale, by its disassembly for renovation -- which normally includes replating -- and reassembly and rewiring. When I take a French fixture apart, I'm always struck immediately by the "one-off" quality, the uniqueness of these pieces. For instance, there are never any stock parts employed. 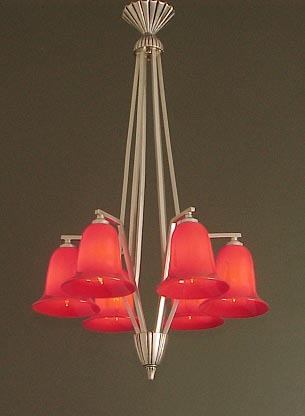 Each chandelier, having been designed as an entity unto itself, has its own particular group of parts. The "body," that part where the wires come together, is designed and executed with nothing else in mind but the esthetic of the rest of the piece. There isn't a standard size, a standard configuration, a standard shape. It might be tiny, to give emphasis to the size, shape and flow of the arms; or it might be large, to de-emphasize the arms and draw attention to itself. The canopy, or "escutcheon," (a bizarre word I just love to hurl around) which obscures the hole in the ceiling, might be uncommonly large or small, it might be any shape imaginable, and it might be decorated as never before seen! I always notice that the quality of connections between the various parts is exquisite! Parts have been exactingly machined, then seamlessly fitted and braised or welded together, with any imperfections long-since filed and buffed away. I also notice that decorated elements are cast with intricate detail and depth. Brass and bronze were used almost exclusively, and castings profited from the use of those materials in their exactness. 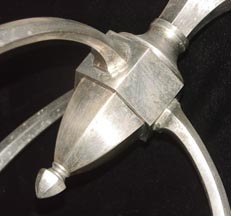 Parts must have been faithfully and carefully machined individually to have such detail and fineness. There had to be uncommon pride on the part of the craftsmen. And lemme tell you about the time it took to make these things! Yikes! I know, because I take them all apart and inspect and tweak every piece that needs it in preparation for replating. Every item is photographed, measured and listed, and then off they go to my SECRET, TOP QUALITY PLATING SHOP where the grunt work is done. Every piece is stripped and polished or burnished (for the satin/brushed effect). Then they're all electro-plated, and after the ride home the fun of reassembly begins chez moi. This can take days, I'm sad to report. Why? Well, first I apply my famous SECRET PATINA. This amounts to putting black in all the crevasses and at other strategic points, to restore the antique look of the item. We don't want old wine in new bottles, do we?! I mean, what could look worse than an 80-year-old fixture that looks like it was replated yesterday?! Note and beware: most if not all other purveyors (read: my competitors) of restored Art Deco lighting SKIP THIS IMPORTANT STEP (or just don't have a clue how to do it, or are too lazy)!! It's the ghastly truth, and if you're buying from pictures on the web, it's particularly hard to tell what you're really getting. But, you don't have these worries when you buy from MOI! Good design is good for a reason -- it pushes the envelope, it meanders into the realm of the improbable. This means that reassembly and particularly rewiring can be downright crazy-making. This fixture, the "final challenge" of my illustrious career, took OVER a day just to rewire! Not only did I have to pull out my few remaining hairs just figuring out how to go about the gruesome task, but... well, how would you get a wire through the angles you see here?! The long and short: now you know why, as you're looking at the piece, something in the back of your mind is saying: "Hmmmm... there's something really special about this moment!!" It's the "je ne sais quoi" factor!! And let's not forget the glass: very thick (sometimes as much as a half-inch!). It's frosted and then polished by hand or wheel to create clear highlights, and thereby give the sparkle and dimension that makes this product so distinctive. 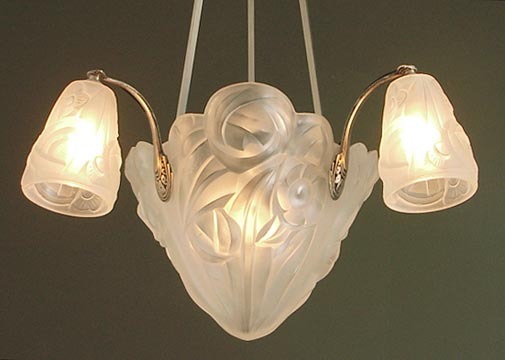 As with the metal parts, the glass has been molded with amazing exactness and detail. Here we have a masterpiece by Degue. 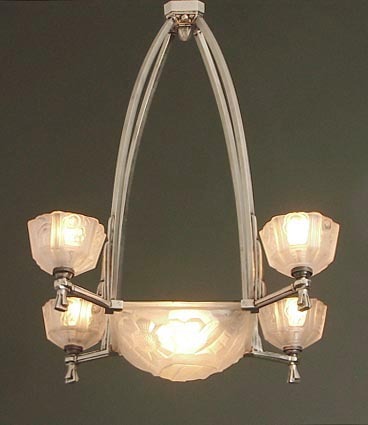 As I've mentioned, American Art Deco fixtures tend to follow a basic five-part template (canopy, chain, decorative element, cage, and finial), and for the most part there was little hand-work beyond screwing the parts together or wiring the piece. As for the glass, it was much more colorful, in general, than the glass on the French Art Deco fixtures. Alas, the color was often painted on the glass, not molded into it, and the ravages of time can compromise that finish fairly easily. Being a lot thinner, the glass is subject to breakage a little more easily. Details, such as floral design, tend to be pretty mooshy. Ah, but are you thinking that Jacques, he has gone over the line and joined the "French snobs?" Does he think, "If it's American, it's trash; if it's French it's treasure?!" Hardly! And if you're getting that impression, let me take a step back! After all, here we are in America! The reality is that the American pieces evoke our Americanness, and rightly so. 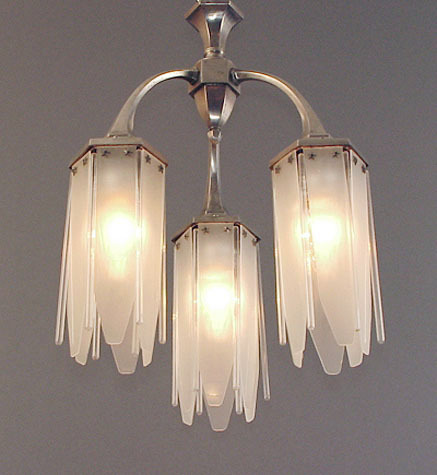 My first Art Deco chandelier, which I proudly hauled home from the famed Marin flea market some 25 years ago, was a Lightolier not too far afield from the one shown above. There were rave moments in the world of American design, and if you care to search out the rarest jewels by designers such as Walter Von Nessen, you'll end up with some extraordinary pieces. And, if you're going for "quaint," the American fixtures can help you achieve that effect. Each to his own! BUT, in my humble opinion, French lighting and French design in general, can "take off the top of your head" by asserting its extraordinary beauty. When I go to France and chase around after these things, I will sometimes round a corner and just gasp at the feast before me -- some object that dances before me, shaking its gorgeous little design-booty and calling to that deep place within me that says, "you owe it to yourself to bring me into your life!" Finally -- believe it or not -- your gentle host is a Vietnam Veteran!! Click here for the full, tantalizing story!